The middle meningeal artery is generally the third branch of the first portion a.k.a. retromandibular part of the maxillary artery, which is among the two last divisions of the external carotid artery. 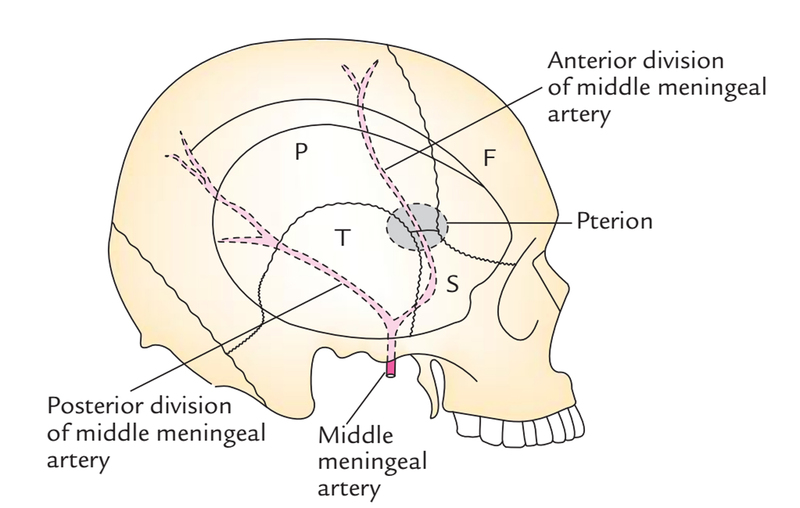 The middle meningeal artery is the largest among three paired arteries which supply the meninges. It arises just posterior towards the condylar process of the mandible from the first or mandibular section of the maxillary artery and goes inside the skull via the foramen spinosum. 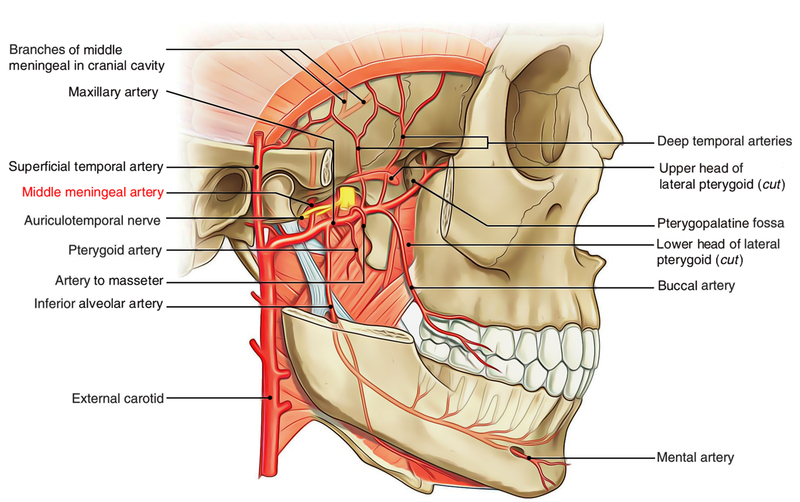 The middle meningeal artery rises upwards, deep towards the lateral pterygoid following the mandibular nerve. It then travels along with meningeal branch of mandibular nerve in the middle of the two roots of the auriculotemporal nerve,in order to get inside the cranial cavity via foramen spinosum. Frontal/Anterior branches travel towards the pterion and afterwards curves posteriorly in order to ascend towards the vertex, located over the precentral gyrus of the cerebral hemisphere. Parietal/Posterior branches cross the lower margin of the parietal bone anterior to its mastoid angle. The middle meningeal artery and its branches are located exterior towards the dura as well as deep towards the inner plane of the skull. Both are supplied by the artery. Several small vessels in order to circulate the semilunar ganglion as well as the dura mater. A superficial petrosal branch which goes inside the gap of the facial canal and supplies the facial nerve. It Anastomoses together with the stylomastoid branch of the posterior auricular artery. A superior tympanic artery travels inside the canal of the tensor tympani muscle and circulates muscle along with the line of the canal. Orbital branches travel via the superior orbital fissure or via distinct channels in the great wing of the sphenoid. Temporal branches travel via foramen in the great wing of the sphenoid. It arises when the middle meningeal artery is injured via a skull fracture near the pterion where the bone is thin and is closely in contact with the inferiorly located vessel. Arterial blood breaks out into the extradural space in the middle of dura and bone and breaks through the tightly surrounding dura from the inner slab of the cranial vault. An extradural haematoma arises in approximately 10% cases of severe head injuries and in four among five cases is associated with a skull fracture. Characteristically, at the time of impact a brief loss of consciousness is accompanied by a lucid period which may last minutes or hours. Epidural hematomas are not essentially related to a skull fracture located superiorly. It commonly arises in the temporoparietal zone as a result of arterial blood loss via a detached middle meningeal artery. It can also arise in the posterior fossa as a result of blood loss from a venous sinus.